I am glad you've been having a good visit with Andrea. I've been seeing your Instagram pics of the visit and you both look so happy! Good luck with the two courses :) you'll do awesome I just know it! Good for you for pushing yourself. Very inspiring. Your dedication really comes through in your wonderful writing!! Happy Canada day! I'm so happy for you darling!!! Your post is so beatiful and full of love!!!!! A lot of kisses for you and Andrea, of course!!! I'm so happy for you Launna. I am so happy that you are working hard with your CPA course. It is not easy. Family times are always good. Blog reading can wait and hey we are family of bloggers. I miss out a lot but when I get time I treat myself to a lot of reading. Best of Luck. I will be praying for your exam to be easy on you. Ameen. I hope that you have been well. I started today following you in Twitter so I will know more about you each day. I am sp proud of you! You can do anything you choose, zed you will. It sounds like you are going to be really busy! I bet it was fun spending time with Andrea. 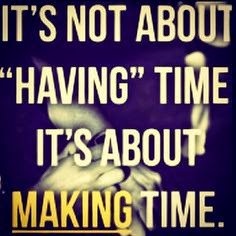 I love the quote about "making time". I always feel like you will make time for what is really important to you. I am always so busy now with blogging, work, spending time with friends, working out, etc. I wonder what I ever did to fill time before blogging haha! It is a lot to handle but I love it all so I make time for it! Our kids are going camping in the same week! I agree with the philosophy about not wanting to look back and regret. That's how I got through raising my felon. I did everything you can imagine and more because I never wanted to look back and think, "I should have...What if I would have.?" Nice inspirational post as usual. I commend you Launna for all that you have accomplished. I wish you the best of luck with your courses and I know you can do it. Congratulations on the visit from your nephew. I am sure it must have been a really exciting visit. Hi Launna, I'm sure you will do it! There is no another way you are very committed person and you will be the most successful student There is no What if's I believe there is only yes you will. I wish good luck in getting this course! Your posts are always thoughtful and inspiring! You can do it, Launna, I know it! :) Happy Canada Day to you. It is so good to read that you have clearly defined the goals that you wish to pursue and are making every effort to achieve them. By taking the steps, one is immediately moving forward and developing as a person. Almost as if by magic we are sure that you will reach your targets and how brilliant that will be. Activity rather than thinking is definitely the best possible solution when one finds oneself in difficult circumstances. You have already proved to yourself that you can achieve so much and overcome many challenges, so you really can obtain these qualifications. And then, as you say, the world is your oyster. Oh I am such a 'what iffer' too... And that's definitely not always a good thing. Dear Launna, I'm happy you had such a good time with your family. I love tacos too :) Nice Einstein's quote! Great post dear! What if...is always a great question! I'm happy you had a good time with your daughter Andrea. I saw her picture on G+, she is so beautiful. Good luck with all you venture on. Giveaway on the blog,come check it out. Aw, yes... lovely Canada & her Birthday yesterday. I hope you had a good time. I'm bad at the What If's, too. They get the best of me. I had a very bad life so far and while I know you shouldn't think of the past or what COULD have been, it's hard most of the time. Wow, that's what your 2 courses was about. I was wondering on that comment of yours yesterday. I believe in you & send you good Vibes! "Of all sad words of tongue or pen, the saddest are these, 'It might have been.'" --Here's for living in the day and pressing forward to make our dreams come true! I often forget that you are in Canada and I couldn't think why you were having fireworks since the 4th isn't until Friday! Oops! I forgot about Canada Day. You are so inspiring -- just keep up the great work and keep reminding yourself of how far you have come. Enjoy tonight! Very inspiring and motivating. I try to live in the present as much as possible. Remember the adage, Today is a gift, that's why it's called the present? Sometimes I find it hard putting that into action because of what if's, leaving us thinking about the past and what could have beens and such. But I do my best to focus on the good things and I believe they are bound to happen. About those 2 courses, I believe in you, you can do it! Hugs. I think it's easy for us to put our dreams off as we get caught up in the daily grind. Sounds like you've figured that out and are ready to go for what you want! Hi my lovely Launna, I agree with all the inspired quotes here, and truly true. how was the wedding? I believed it went wonderfully:). I saw your did something sweet on twitter, I will make time to look after this:). Thank you so very much for being so beautiful! Wish you a lovely week ahead too my lovely girl:). It is really easy to get stuck on the "what ifs" and lose focus on what can be. I've been there, I think most have. We always see what we could have done once its in the past, but I know for me, I focus on that and forget to apply that to the current. It's true, what you wrote. People should live and don't think "what if...". We waste so our time. Amiga bom dia DEUS te abençoe neste maravilhoso e por toda sua vida. You're such a wise woman Launna! I always enjoy reading your posts. I'm so excited for you! All the best on the CPA and that walking too. Sounds like a wonderful plan! I'm glad you are moving forward. One of my favorite posts of yours.I love it so much!!! A post full of love!! kisses!! I'm proud of you Launna! Good luck with the busy schedule and getting your CPA. 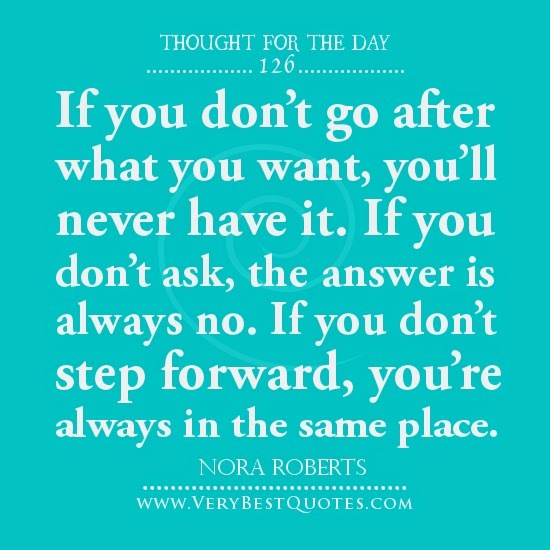 It's always so good to just go for it and stop wondering about all the what it's. I love to hear from you and it means a lot to me that we are both able to stop by and visit each other with our crazy schedules anymore. I am making it a priority to take care of myself for once. That means learning how to eat really healthy and get back to weight training and get strong. I have been so tired and needed a pep in my step. So as you know having a 3 year old boy makes it kind of difficult to do all the things I am trying to do. 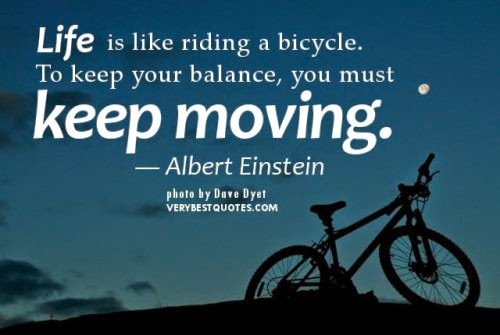 Keep on going is my motto and while one day may be difficult, the next has to be better right?! Have a great holiday weekend Launna! I always love your posts Launna. they are always so uplifting and inspirational! Hi my sweet Launna, I am so happy to hear that you had a wonderful time with your family.. 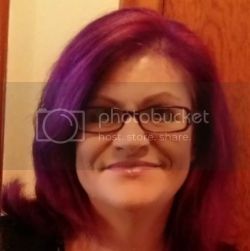 I hope you made it to the fireworks, me and my hubby are going to take our boys to see fireworks tonight and have the picnic kind of dinner night while waiting for the fireworks start:). please stay you, you're beautiful, and the what if needed to go, and keep moving on forward as you are willing to do:). I'm not a what if type of girl so I agree with your moving yourself on:). The words cant describe me how life is much more fun and sweet as is as easier as well when we are women with the right man, who is kind, cares and love us who we are. Keep be you, be beautiful you, and one day that kind of man will also seeking for your love. Wish you really blessed day my sweet girl! How are going the course? Have a positive week dearest Launna! You're so inspiring Launna! Have a great weekend! Wishing you a beautiful Saturday Launna. It sounds like you had a wonderful visit with your daughter. Nothing like having fun with family to make the world feel a little rosier. Enjoy your "me time" while Valentina is away at camp. You deserve it. I'm happy to hear that you had your daughter Andrea spend some time with you that's lovely and I hope you enjoyed it. I wish you all the best with everything that you need to complete and I admire you so much for going to do the course. I felt the same when I decided to do my post graduate course in law this year and did it for similar reasons. Now I'm struggling to finish it because I am so depressed, just hope I can hold on for another six and a half weeks. I can't thank you enough for all your support. I feel so lucky to have met you because you are so kind and it is rare to find someone who understands. I wish all my friends in my non online life had not pushed me away and shut me out because I got depressed. I feel alone so that is why your support means so much. Hi my lovely Launna. Just wanted to stopping by to say Hello real quick, and off to bed! I will be right back tomorrow:). I'm so happy for you and I hope you had a great Canada day long weekend. and yeah that would be great to be able to go anywhere in Canada!! Thats it, if we all dwell in what ifs, there would be nothing concrete or our motivations wouldnt be achieved. :) <3 Dont worry we all have those moments, we just gotta go out there and do! Its so difficult to catching up on time when we are living on a different time zone:). I can't wait to read your new post:). Hope your both courses are going well with you. I am now have to gets up early to exercise before my kids are up and going to bed early as well. will do and thank you so much Launna, and please you do the same:). Will talks again soon:). Have a wonderful week ahead lovely Launna! Have an incredible day as well sweetness:). I Love the first Quote. Great post! Launna, it's been a while since I've visited your space, and I have to say I love the message here. What ifs consume me, bad & good. Thank you for sharing what's in your heart!